This letter was published in Only Paper Today, a Toronto-based art magazine begun (and edited by) Victor Coleman at A Space Gallery. The seven artists who signed the letter were all part of the fine arts faculty at York University. It was written and published after sensational articles appeared in the Toronto Sun and the Globe and Mail. As artists and human beings we protest against the political gesturing of Strike journal which advocates knee-capping and other barbaric acts in the name of political ideology. In the past we, as artists, have supported C.E.A.C., the Kensington Art Association and Art Communications Edition, (three associations essentially run by the same core of people and endorsing the same philosophies), because they have raised important questions regarding art and its role in society. Although we have no argument with individuals who would advocate the use of artistic media as agents in social change, we deplore Amerigo Marras’s exploitation of an artistic journal to support the terrorist tactics of the Red Brigade as a necessary and acceptable political strategy. It is impossible to support methods of social change which include mutilation and murder. In the last two issues of Strike the publication’s board of directors, declaring its impatience with art, has decided to drop its art guise. Advocating a complete rejection of art as we know it today, Strike has made the transition to radical political activism… “in the present socio-political context it seems that a radical function for art can only exist as a negative one. Only a criticism is possible and not a positive practice…” Strike has chosen to approach social change in the most negative and intentionally destructive terms, and stands for disruption and terrorism. 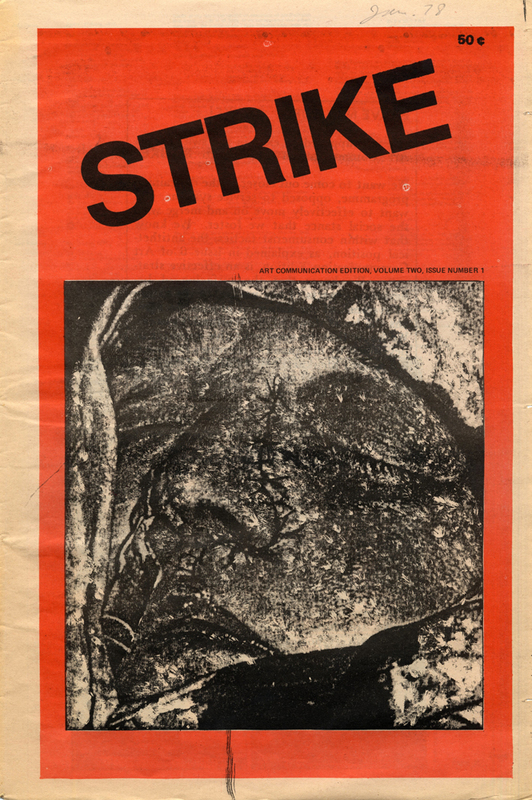 Ironically, Strike is the official publication of C.E.A.C. which relies for the majority of its revenue on federal and provincial funding. C.E.A.C. has been deemed eligible for government funding for several reasons: 1) It has already received $250,000 in the form of grant money which establishes its credibility, 2) It demonstrates its professional group competence in owning its own four-storey building in downtown Toronto, 3) It has one of the best video communication systems in Toronto, 3) Recently it has sought assistance to start a Free International University and gains prestige from its international connection with social philosophers, activists and artists such as Joseph Beuys, 5) It has conducted several symposia on ‘Behaviorist Art,’ ‘Contextual Art,’ and most recently will conduct a three month “School for Marxist Education” this summer. Having established a façade of respectability, C.E.A.C., through its affiliated publication, has now formed a political front to denigrate all art-making, to urge the overthrow of all existing social structures and to declare its support for the terrorist strategy of the Red Brigade. Now that Strike has declared its destructive platform, continued financial aid by the provincial or federal government must be seen to be a support of the publisher’s connections and entrenchment with violent international political revolutionaries. It is equally ironic that Strike’s indulgence in self-promotion by sensationalized and deviant behavior, and its endorsement of “leg shooting/Knee capping to accelerate the demise of the old system,” has been supported by the tolerance and silence of an art community unwilling to take any moral stand on art or politics. The back page of the issue of Strike in which this statement appeared, solicits subscriptions under the banner of the Red Brigade and the logo of a machine gun. We urge artists and other persons concerned with human rights, to protest against individuals and groups which support the Red Brigade and leg-shooting as political solutions. We are apprehensive that this letter will play into the hands of Strike and allow them to accuse us of supporting all the weaknesses of the capitalist system or of limiting freedom of speech. We are further apprehensive that Strike will exploit our letter to discredit Canada Council’s and Ontario Arts Council’s valuable contributions to the arts. We have no complaint against the art councils’ support of legitimate art – only against the support of art as accessory to mutilation and murder. Signed by: Fran Gallagher, Bruce Parsons, Alison Parsons, Natalie N. Green, Toby MacLennan, Ron Shuebrook, Art Green.